What the Guatemaltecos call their capital when they want to save syllables. Somewhere in the highlands, amid precipitous mountains and narrow valleys jigsawed by small plots of corn and squash, lives a seven-year-old boy with just one leg. Our hope is that we may be able to change his future. Dani has a congenitally absent lower leg on the left and a club-foot deformity on the right. Suspected cause: Amniotic Band Syndrome, a spontaneous development of scar-like bands in utero which physically stifle the normal stem-cell creation of extremities. U.S. surgeons From Operation Rainbow had operated on his right foot during a “medical mission” type trip a year ago. But they had no plan to help the boy post-op. 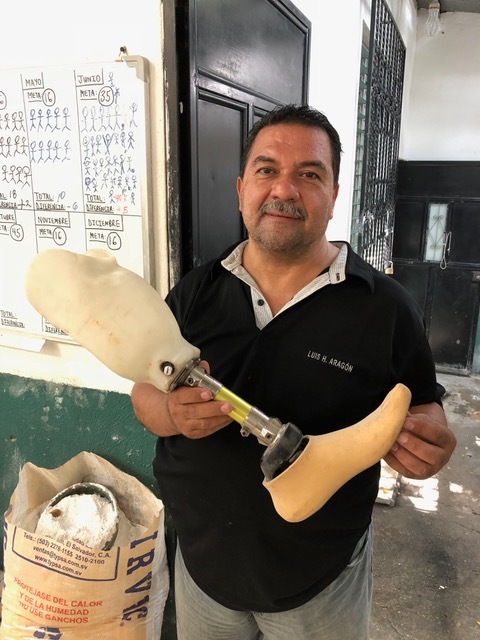 Steve and Sandy, who volunteered with the fly-in surgeons as translators and logistics facilitators, arranged to get what Dani needed to function: a prosthesis on his left leg stump. 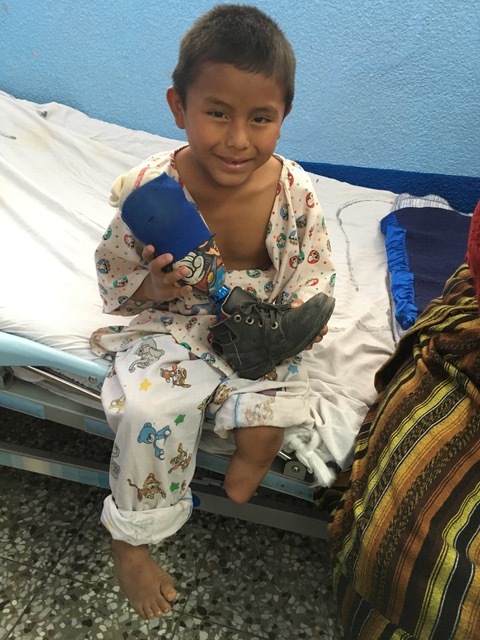 This trip’s purpose was to check on Dani’s progress and assess whether more formal referral arrangements could be established for kids like him who lined up for help each time these surgery clinics came to the country. People park their wheelchairs on road medians all day to beg coins. A reminder of the likely fate of a physically impaired kid in a country as poor as Guatemala. And a reminder of what kind of life we want to help Dani avoid. He lives in a mountain town, a three to five hour drive over a very rough and dangerous road from the nearest city with resources. You appreciate the beauty carefully, lest you slide off the road and become yet another nameless cross. The folks who live in his town are primarily indigenous who speak Q’anjob’al, one of several Mayan dialects. Facility with Spanish is still limited here. What we found at Dani’s house was both disappointing and enlightening. He walked with crutches so smoothly, it was clear that he’d been using them, rather than the prosthesis, for a long time. Without crutches, he walked as clumsily as his handicapped chicken. Moreover, he held the prosthesis off the ground as he walked. We found that his stump had shrunken, was very loose in the socket of his prosthesis, and had already developed a couple of inflamed, sore spots. I was worried that the skin would soon break down, and probably get infected. Also, the brace which was meant to hold his surgically corrected foot in the normal position was ill-fitting and loose. Already his foot was twisting back to its abnormal position. He wore shoes with no laces – no support. The path to his house from the road was steep and slippery. The front patio of his house was of dirt (mud in the rainy season) and uneven. A poor surface to practice walking with a prosthesis. He has a supportive mother and family, but no father (he’s in “the North.” A place where, we learned by speaking to several townfolk, a large percentage of the men had gone. They work in the U.S. and send back money when they can). But Dani’s irresistible dimples show you how much he would love to run and jump and play soccer, like any other kid. His physical limitations show no signs of dousing his spark for life: he put on his prosthesis and followed us up the steep path between their corn fields as we left. Re-assessment by the prosthetist who built his device. Problem is, that professional’s office is eight hours drive from Dani’s town. A Physical Therapy professional to teach him and his mother how he should walk with the prosthesis and his club foot. Problem is, there are none in his town. A flat surface at his house to get proficient at walking. 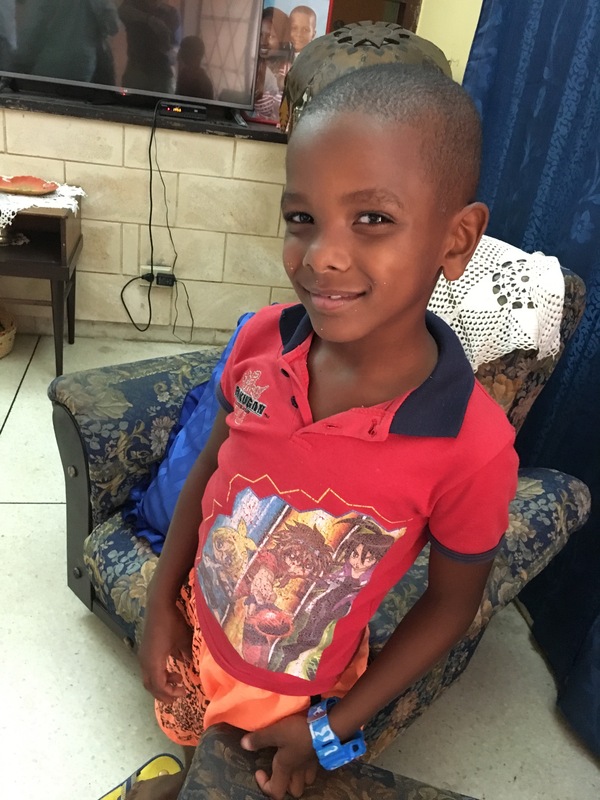 Some financial assistance to augment their expenses for travel, modification of orthotic equipment as he grows and wears them out with normal childhood activities, and school supplies (he has had very little schooling so far). We followed up on a lead to find this 11 year-old boy, Mario. He was at school in Dani’s town, running and playing soccer. His prosthesis is a cheaper version than Dani’s, but his optimism and energy are similar. His deformities are congenital, like Dani’s. Our hope is that the two of them will bond and re-inforce positive aspects of living with prostheses. What the Guatemaltecos call Huehuetenango, the city closest to Dani’s town when they want to save syllables. An energetic community supporter, Manolo, who will bird-dog Dani’s needs. What the Guatemaltecos call Quetzaltenango when they want to save syllables. We travelled two and a half hours from Hue-Hue to this city, looking for the prosthetist who made Dani’s device. We found him. Showed him our videos and pictures, asked his advice. He had solid ideas of what will be needed in terms of prosthesis and braces. He offered us all the options but suggested the less expensive. We liked that having Gringosin his office didn’t result in his recommendation for the most expensive options. Additionally, he will travel to Hue-Hue twice a month to see patients, including Dani. His taller (workshop) can manufacture whatever is needed. Food here was “basic” and, to decrease risk of diarrhea, we ate what had been cooked to high temperatures: beef (or was it leather?) and slow chickens (those tenderized beneath the tires of passing trucks). Found a restaurant in an old Spanish-style building constructed as a large square with a central patio. The patio had originally been open – a garden – but now was roofed. We were the only customers other than a large wedding party. Sat in the second-floor balcony and watched the bride in Mayan dress and the groom dance on the patio below. When the DJ followed up a traditional song with Elvis (Jailhouse Rock), the groom discarded his jacket and the fun level increased. Due to the Mayan-Spanish-English language disconnect, the irony of the song was no doubt lost on the heterosexual bride, groom and guests. But Elvis still sang ‘Number 47 said to Number Three; you’re the cutest jailbird I ever did see – – – ’ as they danced their pre-honeymoon frenzy. She was round-faced, with a smile of glittering teeth. As a wedding played out on the patio below, the topic of marriage somehow came up. She said she was 30. Two kids. Husband was killed in what sounded like a brutal attack about which we didn’t request details. Financially strapped, she made a trip north, looking for work. Arrived at the Rio Grande across from Texas. She told us she had to pay $500 to be boated across or else face significant physical and sexual abuse. Once across, she walked north thru the scrubland until, dehydrated and on the verge of unconsciousness, she stumbled into a hospital E.R. in McAllen. “They were wonderful,” she said of the E.R. staff. They resuscitated her. But she was soon captured by I.C.E. and deported. Even for city-dwellers, life is not easy in Guatemala. ‘Twas a surprise to learn that Guatemala is the world’s leading producer of this spice. High in a rain forest, where we bumped over a pass between the lowlands (Zacapa) and the valley area surrounding HueHue, we met an eccentric guy who raises bonsai and orchids while he manufactures machines to separate the seeds. This ten-foot high plant has very small white flowers at its base. The seeds develop there. For commercial use, the sprouted seeds need to be separated from those still intact. This drum, laden with wire spokes, achieves that as it tumbles the seeds. Try baking it into your bread. Or put a little in your coffee. My skin puckered. I shivered. Déjà vu of medieval rituals from childhood. Although Fundamentalist Protestantism has made deep inroads into Latin America, many folks, including indigenous groups like the Maya, have transformed their traditional beliefs into Catholicism. The lady in the turquoise jacket was shuffling her way to the altar. On her knees. Down in the more sophisticated (and more European) city of Xela, this apparition issued forth one evening. 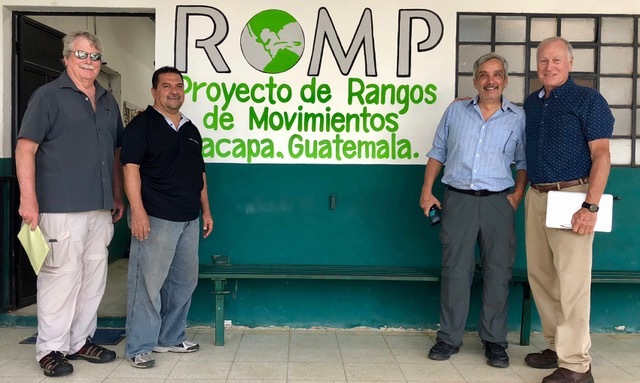 A U.S. and Guatemala based organization which provides prostheses and long-term support, Range of Motion Project (ROMP), looks to be a good resource for patients who live closer to the capital and the lowland town of Zacapa. They re-purpose expensive components from the U.S., manufacture prostheses in country and have made prosthetic hands with a 3-D printer. We arranged a referral pattern for future patients from Rainbow’s surgical clinics in Guatemala City and in nearby Honduras. This foundation, based in Sacramento, has supported children with burns who need surgery, and is now also willing to provide some financial support to amputees we identify via Operation Rainbow. With this crucial link, we believe there’s a referral system in place. Not an easy or perfect system – nothing looks to be easy or perfect in Guatemala, especially transportation. But support is there for Dani, and there is the potential for expansion of the system to other kids who will need it. The Revolutionaries are dying out. Tourism has eclipsed agriculture as a major revenue source. 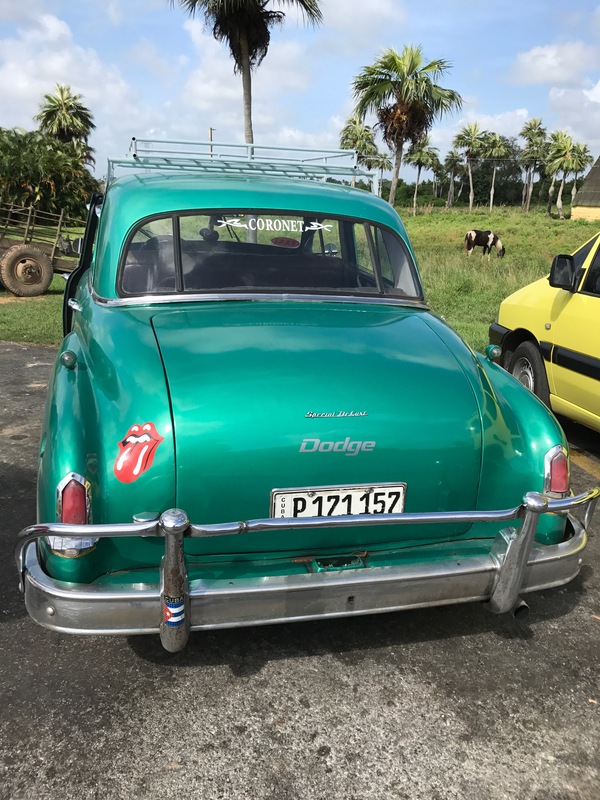 The life blood of Cuba – music – got a transfusion from the Rolling Stones. Even amid the recent anti-NRA backlash, Cuba was a powerful undercurrent. And the island’s birth rate and child mortality rate made me simultaneously flash back to Bolivia in 1970 and flash forward to the world I won’t live to see. I. Politics – Raul, Fidel’s brother, has said he will retire from the presidency in April. 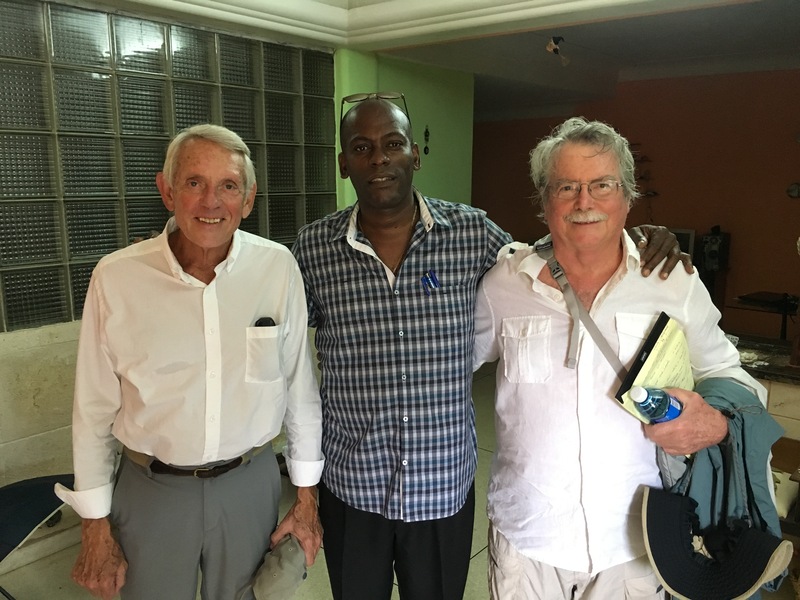 Three of the most famous (still living) stalwarts of the Revolution are going with him. They’re all over 85. But Cubans have not embraced the Castro family un-critically. 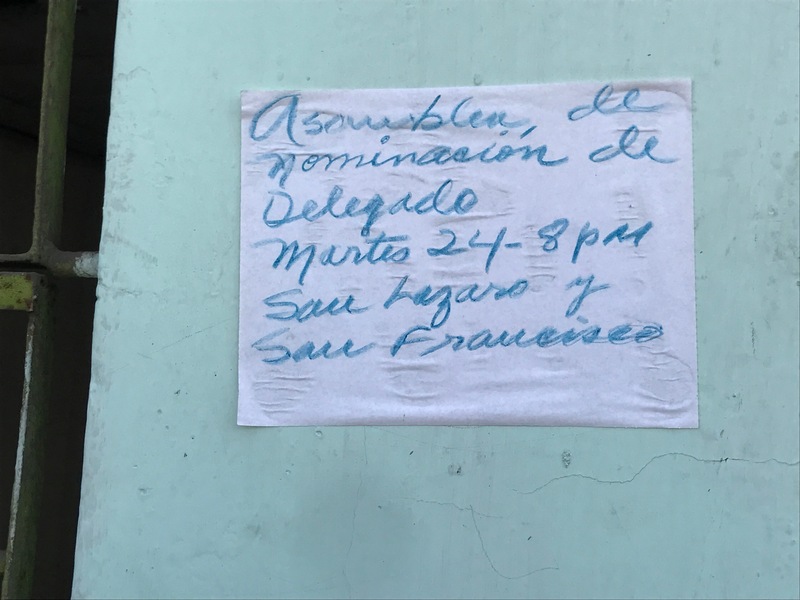 What the Cubans told us about the brothers: they are effusive in their love and admiration of Fidel; derogatory about Raul. He has not connected emotionally with the Cuban people and has simultaneously rankled hardliners by saying that Cuba needs younger leadership and by his détente with Obama and the U.S. The president is elected by a Council of State. That Council is formed by the National Assembly. The Assembly is composed of one member for every 20,000 Cubans, elected by local (municipal) and regional (provincial) voting. At the municipal level, membership in the Communist Party is not required to be nominated. Interesting to note that Raul’s son is not eligible to become president because he did not get elected to the National assembly. II. Cigars – It was a family-owned tobacco farm. After 1959, the government took it over. The brothers got wages, usual benefits (health care, education, literacy) and can keep about ten percent of the crop for their private (although clandestine) sale. Tourists stream thru their farm and populate the surrounding agricultural zone of Viñales. 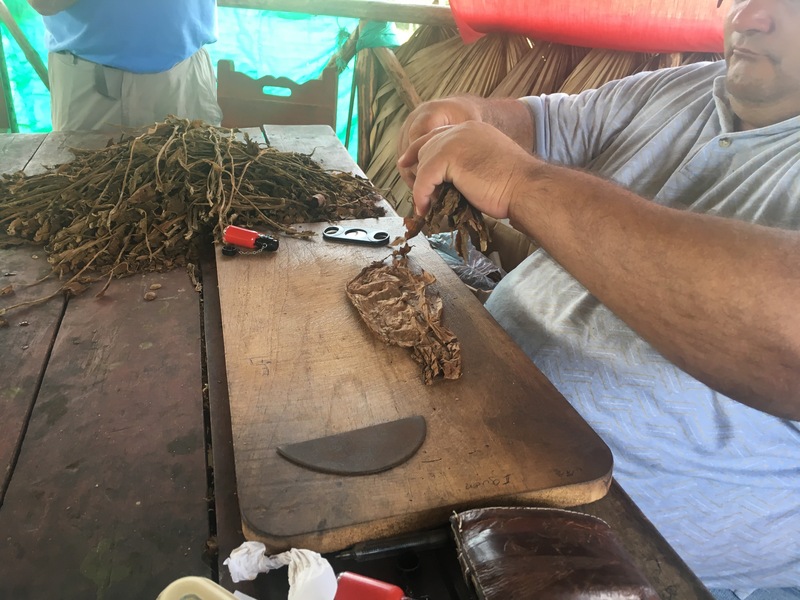 This brother hand-made cigars from broad, cured leaves. He discarded the central “vein” of each leaf. “Too much nicotine in there,” he explained. They recycle that part as an organic insecticide. 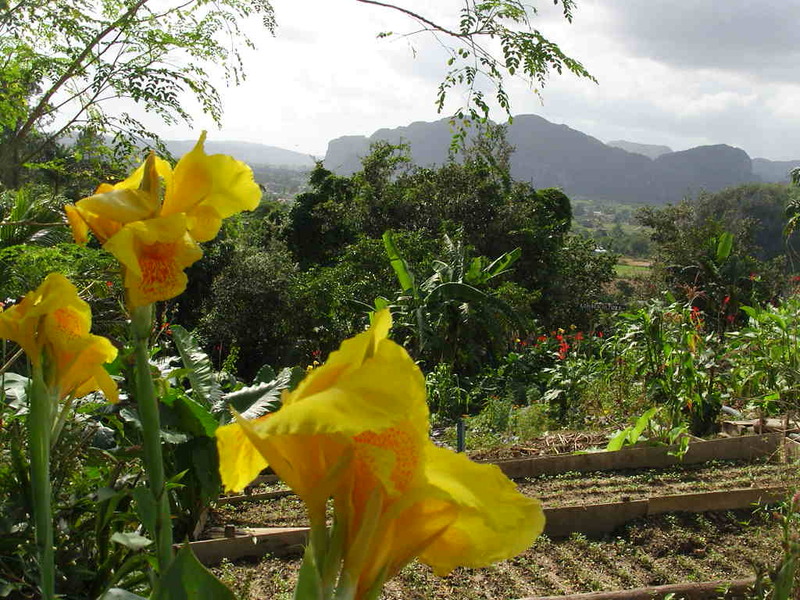 Cubans exuded pride about their organic farming initiatives. We saw organic farms in several areas, including the city. 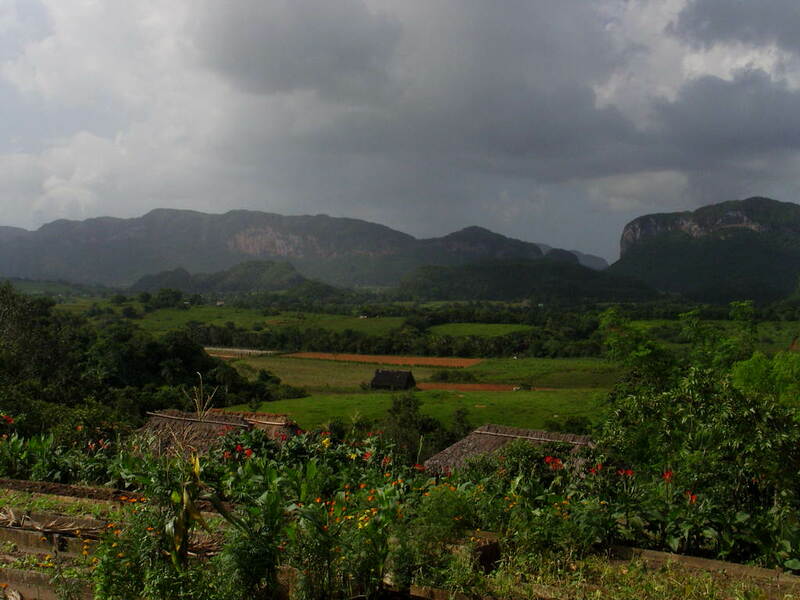 But this one – the Finca Agri-ecológica– in Viñales, was large. III. Beaches – On the southern coast, the sea is blue, sandy, warm. A stark contrast to the brown, foaming waves that battered the Malecón. 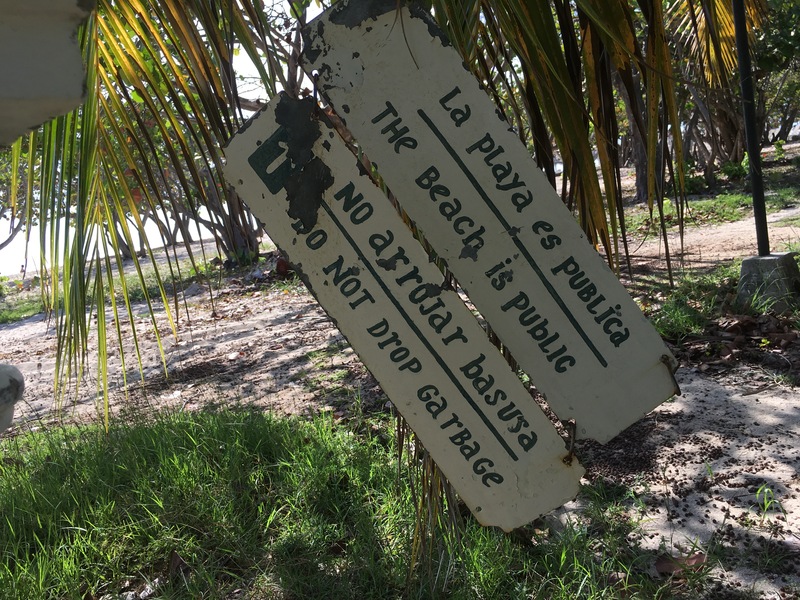 All beaches are public. 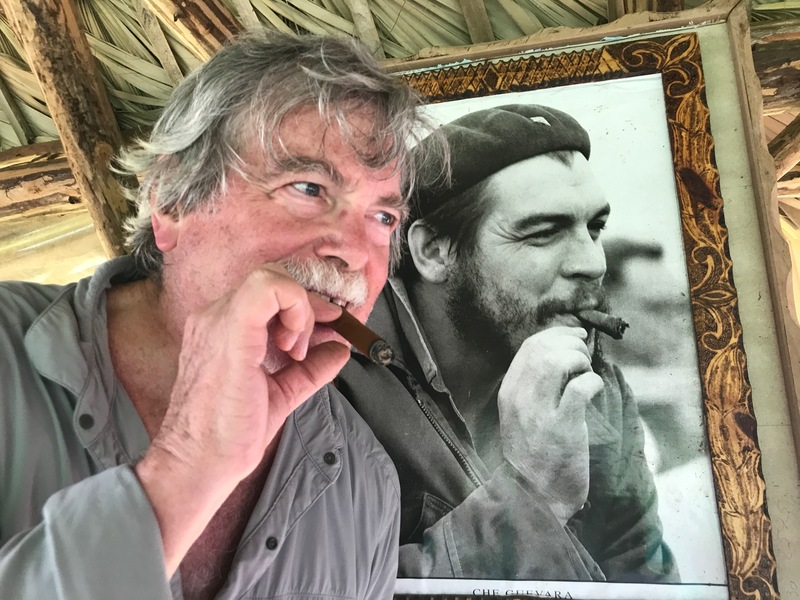 Cubans and tourists shared. Tourism booming. We explored the exterior of the US embassy (still cleaning up post-hurricane). We experienced no symptoms. Saw no anxiety from embassy employees. There have been reports that the Russians had used sonic attacks in the past. Required investigation. So we went to their embassy. Symptoms experienced there were of questionable veracity. A few more Cuba Libres may help. But more professional investigators came up with a plausible explanation. Computer scientists from Univ. Michigan found that similar high-frequency signals like those recorded in the US embassy can be elicited from security systems which use ultrasound. Signals from such motion detectors can become audible if another near-by U-S device induces interference. The inaudible 32 kHz signal then becomes an annoying high-frequency “tinny” sound of 7 kHz which matches the Cuba recording. “Cuba is the Safest Country for Tourism.”This pronouncement by the International Tourism Fair in Spain, January 2018. Is it safe in Cuba for the same reason it was in Paraguay during the 1970’s? A populace terrified to break the law in a Police State with torture chambers and the inclination to drop dissidents from airplanes? Where you can’t go a block without seeing police, as in Argentina, Uruguay, Northern Ireland? 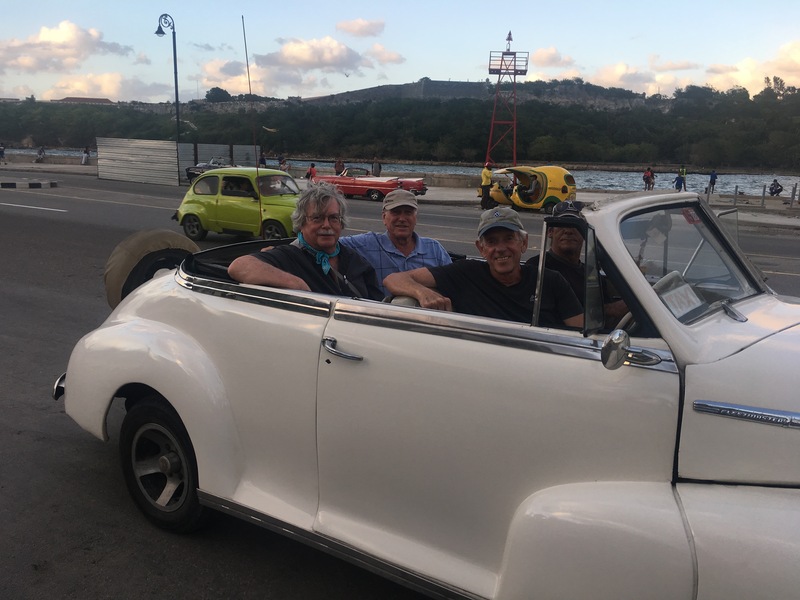 Actually, the only cops I remember seeing in Cuba were directing traffic around an accident and occasionally pulling over speeders on the divided highway. Saw less police presence in Cuba than in downtown Seattle. V. Music – We heard it everywhere. Jazz, Rumba, Son, Salsa, Rock. 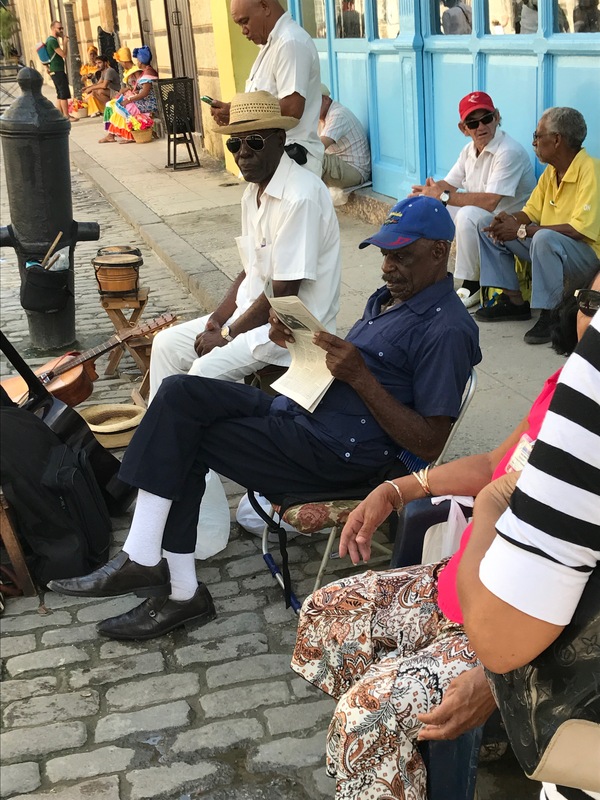 Felt as though music might be more important than food to Cubans. The Obama – Castro détente resulted in the first visit by a U.S. President to Cuba since the Revolution. It was scheduled on a day that conflicted with the Stones’ planned concert. So Mick and Company moved their performance date. Crowd estimate: a half million. Explains the Sticky Fingers decals on many cars. His smile sparkled. He pulled out a small electronic device. 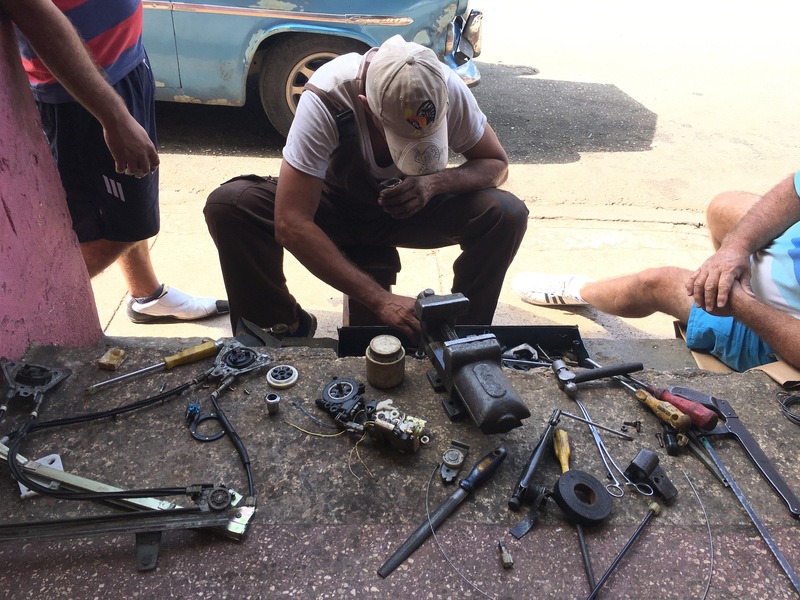 “El Paquete,” he introduced us to the plug-in that he (and much of Havana) gets delivered every week by street entrepreneurs. VI. 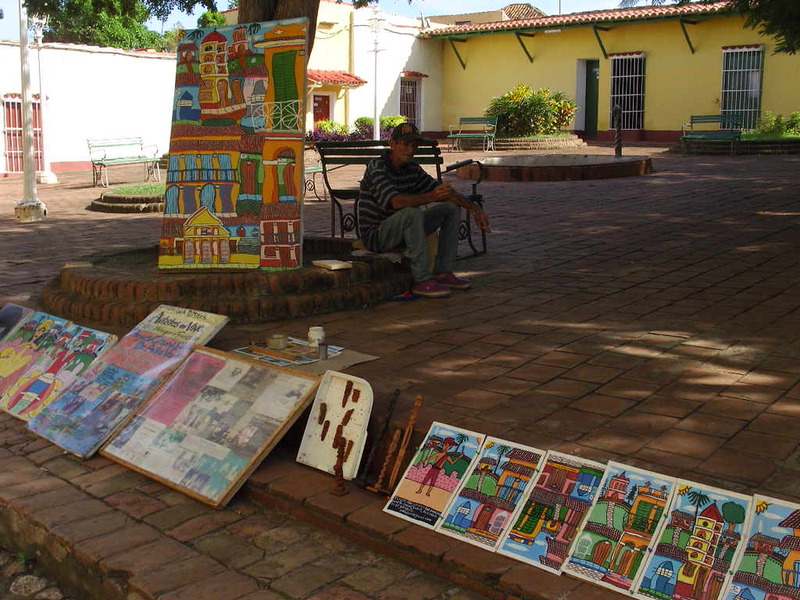 Art – In addition to music, art is ubiquitous in Cuba. 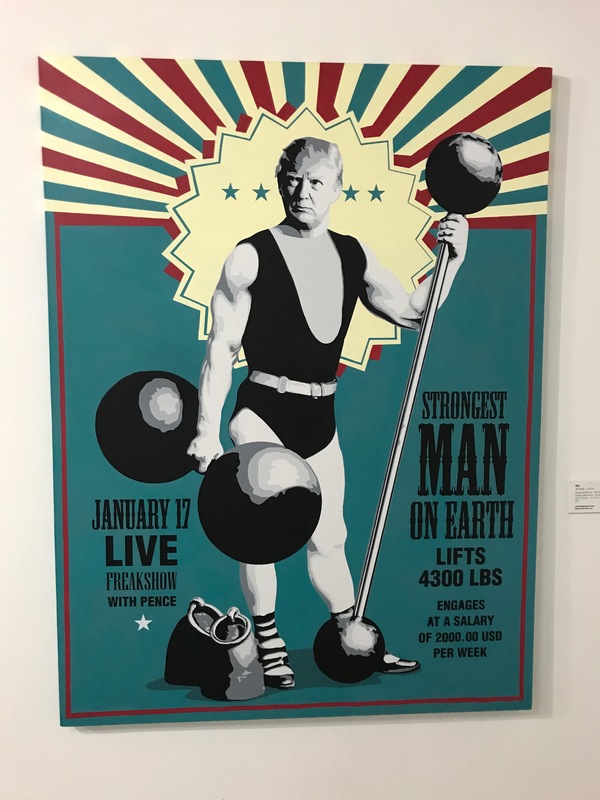 As with all art, some of it was good. They sell it on the streets and in studios. The most fascinating venue was the Fábrica de Arte, a re-purposed factory where we had an espléndido dinner (Happy B’day to one of us), then explored the internal labyrinth. The place throbbed with some primal Latin music. Young Cubans, dressed chic, exuding cool, strolled around us, drinks in hand. The wave of free-enterprise enthusiasm sweeping the island spawned paladares– restaurants catering mostly to tourists. As mentioned in Número Dos, our friends had given a favorable review to one of these near our B & B. 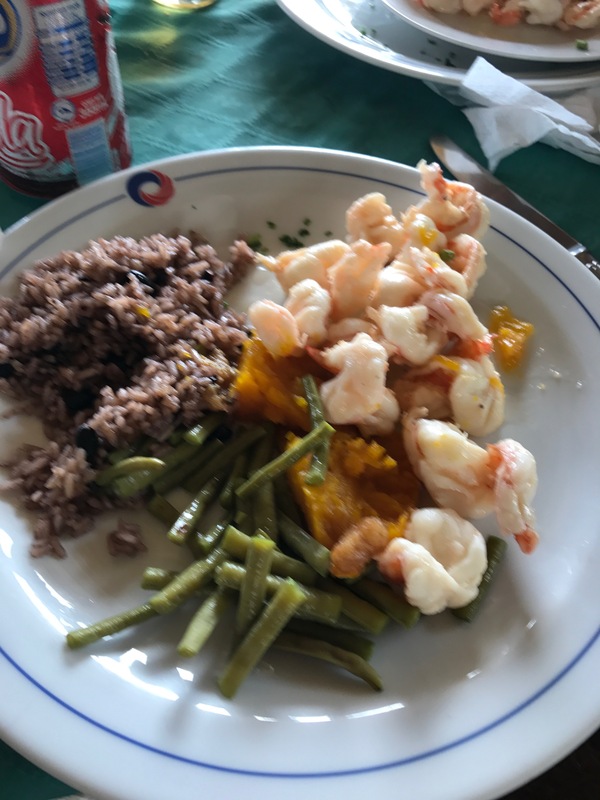 And the restaurant nestled into the Fábrica de Arte had served food as tasty as you’d mouth-dissolve in any upscale U.S. place. With prices to match. But these were somehow – – – disappointing. I was looking for something different. Something – – – Cuban. 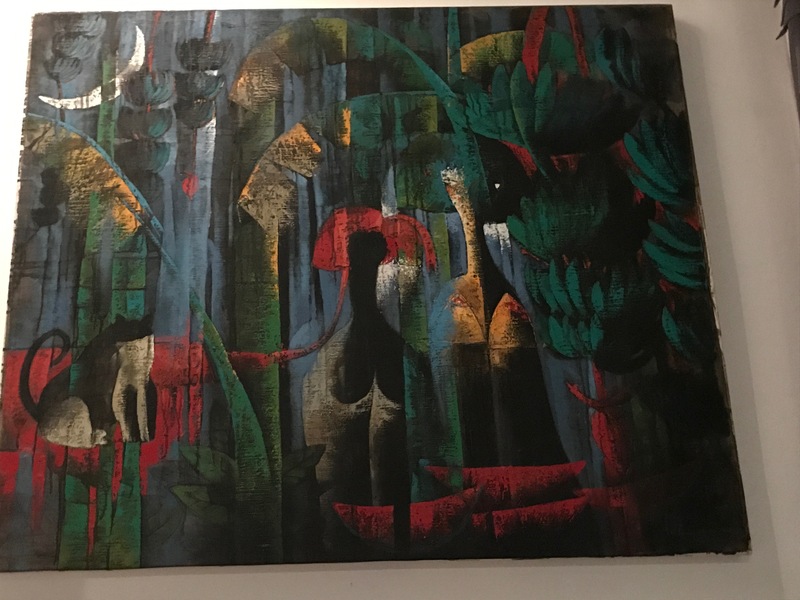 On a night of warm Havana drizzle, we were led by a Bouncer-bodied maître d’ into a room of pristine white walls hung with sensuous paintings by local artists. Beneath the sultry gazes of painted girls with naked breasts and ebony-muscled musicians, we settled into a table. White cotton tablecloth, gleaming stainless cutlery, a candle. A young waiter with slick black hair, wearing a starched white shirt and black slacks, trembled a little while striking a match to light the candle. Then, careful to approach us from the left, he handed us, one-by-one, large, professionally printed menus. A half-dozen Appetizers; entrees of beef, chicken, seafood; even a couple of vegetarian options; a wine list. Most dishes were what you’d find in Europe or the U.S., translated into Spanish. The lone traditional dish: Ropa Vieja (more tasty sounding if not translated). “Old clothes” is shredded beef. “No importa,” we tried to reassure him. And ordered Chilean wine. He bowed awkwardly as if it were his first time and backed out of the room. Our waiter re-appeared and cradled the bottle in his French-cuffed arms for Steve’s approval. Then there was a struggle. Corkscrew, foil wrap, bottle, cork, all too confounding. Our poor waiter, his lips pressed together so tightly I thought they’d bleed, flailed to maintain dignity as the process frustrated him. “Have you ever opened wine before?” Steve disarmed his question with a laugh. The Cuban kid imprisoned within starched cotton and a façade someone had taught him, relaxed enough to laugh in reply. Steve pulled the cork – slowly so the kid could watch – then handed the bottle back to him so he would be our waiter again. In the gleaming dining room – mimicking the cold sterility of some upscale Miami place – the food tasted like in the States. 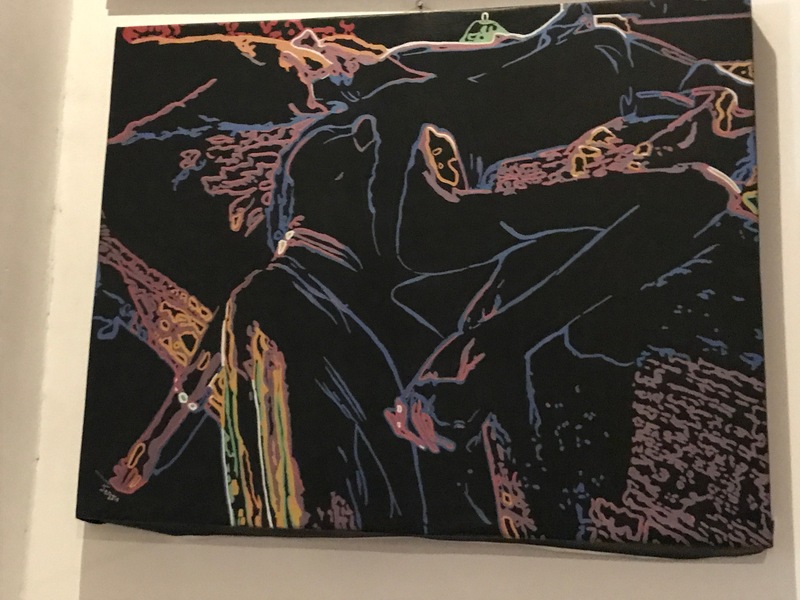 But beneath the vibrant eyes of the paintings that watched us, attended to by a waiter who was now a friend, the experience had become, at last, Cuban. As we rose to leave, a waitress brought us each a paper flower. White, of course, but obviouosly, thankfully, hand-made. On an afternoon of glaring sun, enroute to the Oriente, our guide told us we’d stop at what he promised would be a “wonderful restaurant.” The road meandered thru thick green hills, where the cows and horses outnumbered cars, houses were sparse, crude and unpainted, and the roadside vegetation grew taller than our vehicle. The restaurant was someone’s farmhouse, unpainted, chickens running free. Raw wood tables on the packed-earth in front of the house, a thatched roof above for shade. The kitchen was a wood-fired grill outdoors. The bathroom was a latrine. Family members, aged between ten and seventy, attended us wearing simple dresses, faded, threadbare. We requested beer to quench (and to avoid potential dysentery from water). 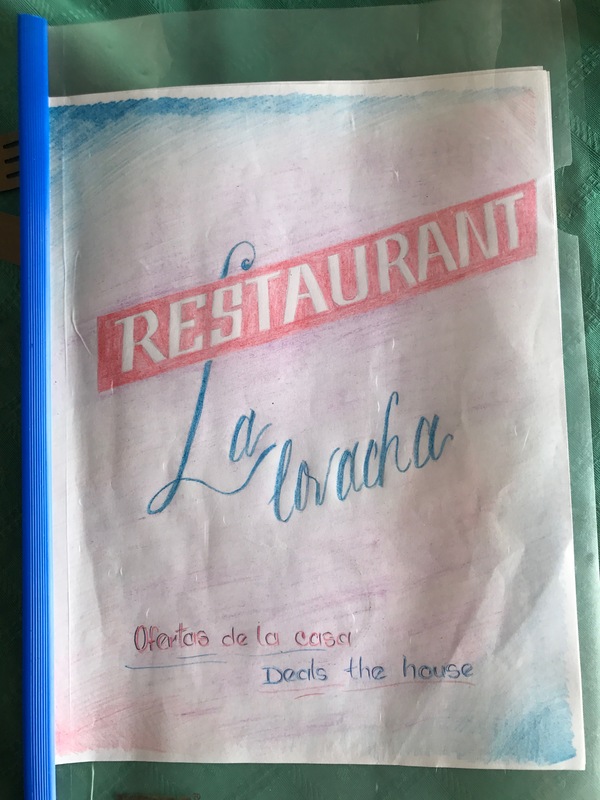 The menus were hand-written, mis-spelled and food-stained pieces of paper. There were, as I recall maybe four choices. Those who had the lobster, served in this most primitive of settings, burst with uncontrollable praise about its flavor for days thereafter. 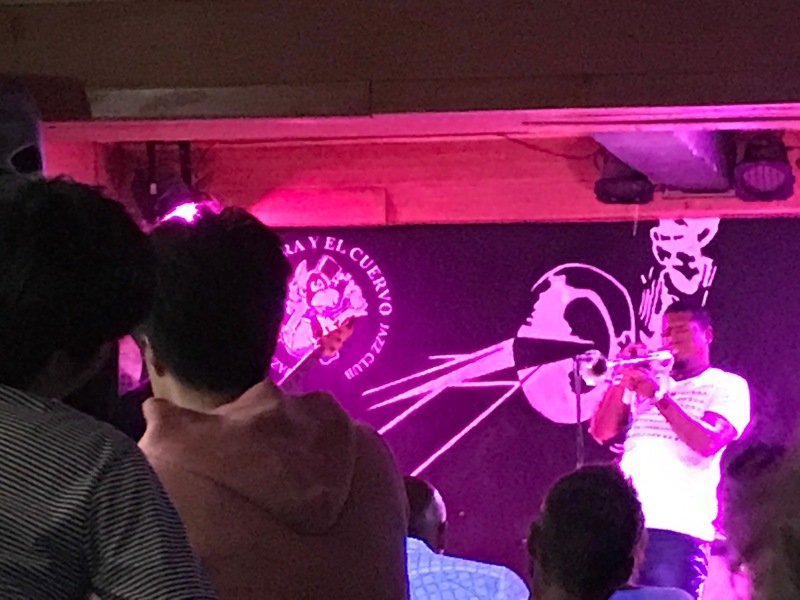 As I observe the enthusiastic efforts of these budding entrepreneurs, I can’t help but see the same spirit in what Cubans created during the pre-Revolution days and have reproduced since in Miami. Then I compare this behavior to that of to other Latin Americans: Paraguayans, Haitians, Bolivians. 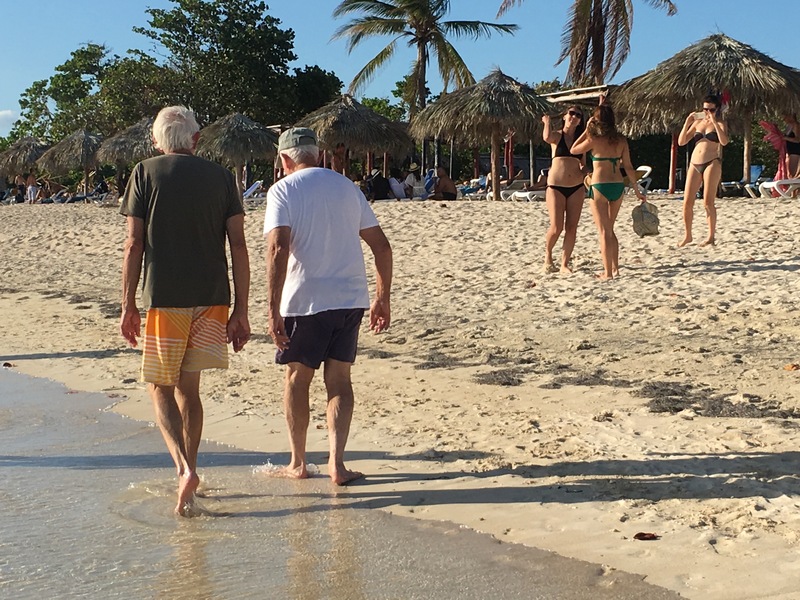 There appears to be a strong gene for Capitalism in the Cuban chromosomes. The poorest sections of Havana were, disappointingly, the Blackest. BTW, researching the demographics of Cuba is frustrating. The percentages are all over the place. Folks whom we would call African-American might fall into the “White” or “Mulatto” categories in Cuba. But I never sensed the alienation and anger there from dark-skinned folks as we do daily (even if subconsciously) here in the U.S.
IX. Sexism – we met women who were veterinarians, physicians, entrepreneurs. 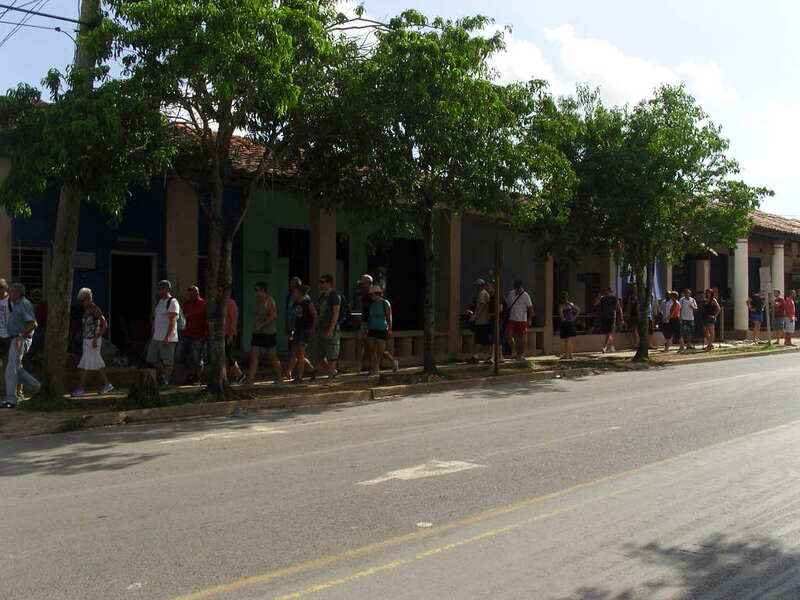 Cubans were proud to point to their record on equal access. The recent election resulted in over 48% of the National Assembly being women. Birth rates generally far exceed death rates in “Developing” countries and Growth Rates exceed 1.0 . I observed one of the major factors for this phenomenon in Bolivia in 1970 where the Public Health physician in charge had been unsuccessful at getting women to accept birth control. They had multiple pregnancies with the associated serious medical complications. However, the child death rate was 50% by age 5. Adult children care for their parents in old age (no Social Security, Medicare or pensions in Bolivia), so women were having five or six kids hoping three would survive to adulthood. He approached this issue from a Public Health perspective. Vaccination of children resulted in lower child death rates and, soon, more little mouths to feed. At which point women knocked on the hospital door, seeking birth control. I suspect similar mechanisms (in addition to social / religious pressures) drive birth rates in other “Developing” countries where a projected 900 million more will be born over the coming ten years. While in “Developed” countries, where pensions, social safety nets and health care are much more accessible, only an additional 56 million are projected. Zero Population Growth, which Cuba is rapidly approaching, is primarily a characteristic of “Developed” countries like Iceland, Finland, Germany, Denmark, Sweden, Japan and others. Which would be Okay, I suppose, if we would feed and care for that population. But an estimated one in eight U.S. residents do not have enuf food. This in a country with a whopping 40% of food waste. XI. More Revolutions – Fascinating to note the roles of two Florida-based characters in the recent March For Our Lives. Emma Gonzales wore a jacket plastered with slogans when she spoke in D.C. Prominent on her right sleeve was the flag of Cuba. And Marco Rubio took to the microphones to tell the kids that he didn’t support their efforts. Is the Cuban expatriate population finally abandoning it stance of vitriolic hatred toward their ancestral island? 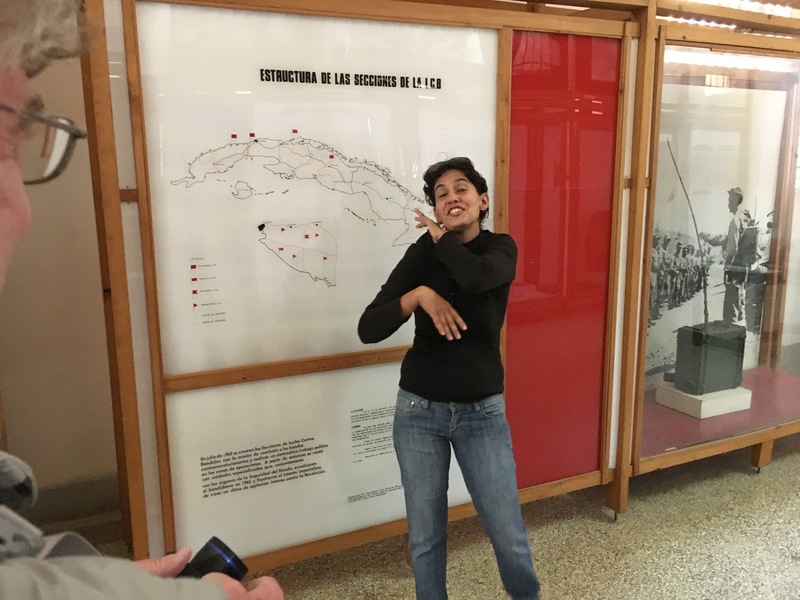 If so, the Cuban Revolution, which has continued to be fought in the U.S. for the past 59 years (long after the shooting stopped), is coming to its conclusion just as the last Revolutionaries fade from the scene. 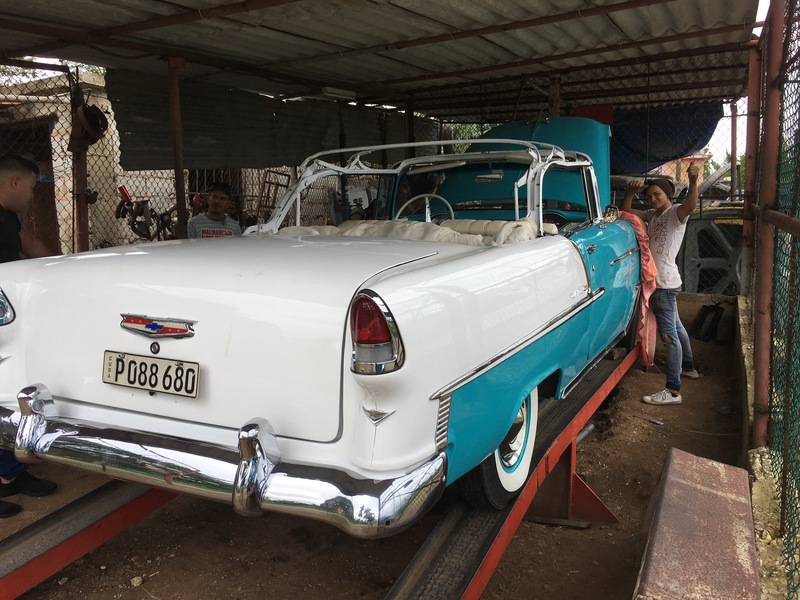 while Cuba’s 59 year-old Idea, resilient in the face of economic bullying, shows the world a Socio-Economic model for the Future. There’s a reason that NRA-purchased politicians don’t want CDC to gather data on gun-related deaths. Doesn’t take a genius to figure it out. (see prior post, below). But there IS data on this Public Health epidemic. And that data points us toward WHAT WILL WORK as Treatment for this lethal disease. Yes, gun-related deaths IS a disease. And the patient is the community – i.e. US. In Public Health, the Physical Examination is DATA and Treatment is PREVENTION. I assume that you are doing what I am – talking / confronting gun-loving friends and acquaintances. Thought I’d share some talking points. Our patient (the U.S.) has a higher gun-related death rate (10.2 per 100,000) than Canada, Japan, Australia, South Korea and at least 19 European countries (they range from 4.8 to 0 per 100,000). Our patient has a higher number of mass shootings than those countries. 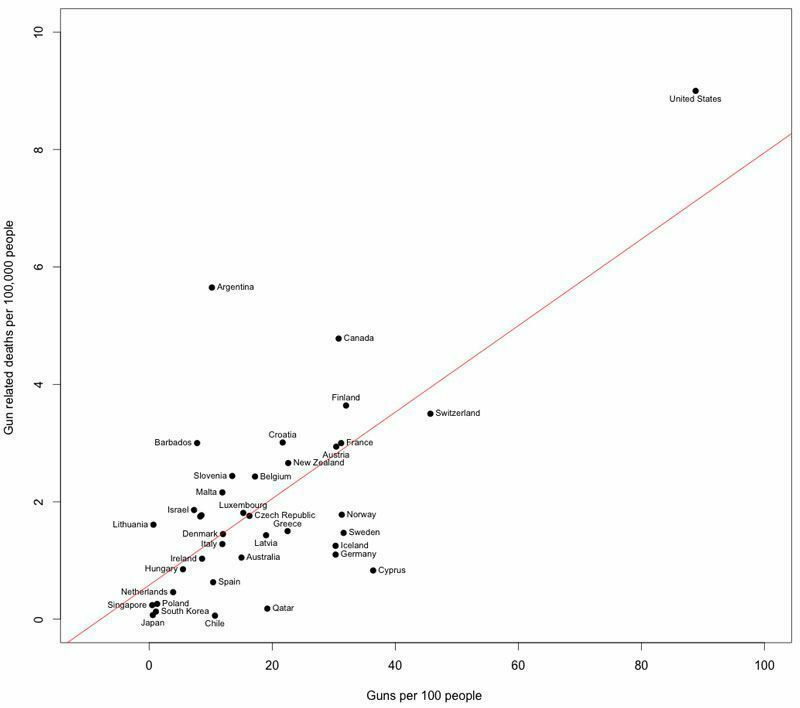 Our patient has a higher Gun Density rate (89 guns per 100 people) than those same countries (range 46 to 1 / 100). Gun Laws in these countries vary, but are stricter than in the U.S. Canada, for example, has three categories of guns: Nonrestricted (e.g. hunting guns); Restricted (e.g. handguns); and Prohibited (automatic weapons). Within the U S, States that have stricter Gun Laws have lower rates of gun-related deaths. Examples: Hawaii, Mass, N Y, Conn all have laws on background checks, permits, difficult concealed weapon permitting, and no “stand your ground” laws. Their death rates range from 2.5 to 4.3 per 100,000. Arkansas, La, Miss, Ariz, Wy have either no laws or much more lax laws. Their rates range from 16.7 to 19.8. Moreover, states with higher Gun Density rates have higher gun-related death rates, mirroring the data from other countries. “Mental illness” is present in Canada, Australia, Japan, U K and all other countries, yet gun-related death rates are not as high as here. Schools are not the only sites where shootings take place. The worst mass shootings in the U.S. in the last 20 years took place in theatres, army bases, offices, churches, universities, nightclubs and outdoor music events. Moreover, 98 % of all gun deaths are NOT Mass Shootings. They are suicides, individual homicides, and accidental shootings (sometimes involving small children). Re Arming Teachers – Two points: Reagan was shot while surrounded by armed Secret Service guys; there WAS an armed officer on campus in Parkland, Fla. I could find no data on the efficacy of this policy. I was looking at a CT scan of one of the victims of the shooting at Marjory Stoneman Douglas High School, who had been brought to the trauma center during my call shift. 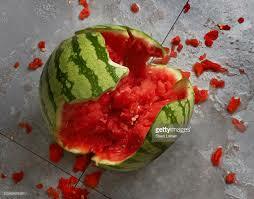 The organ looked like an overripe melon smashed by a sledgehammer, with extensive bleeding. How could a gunshot wound have caused this much damage? 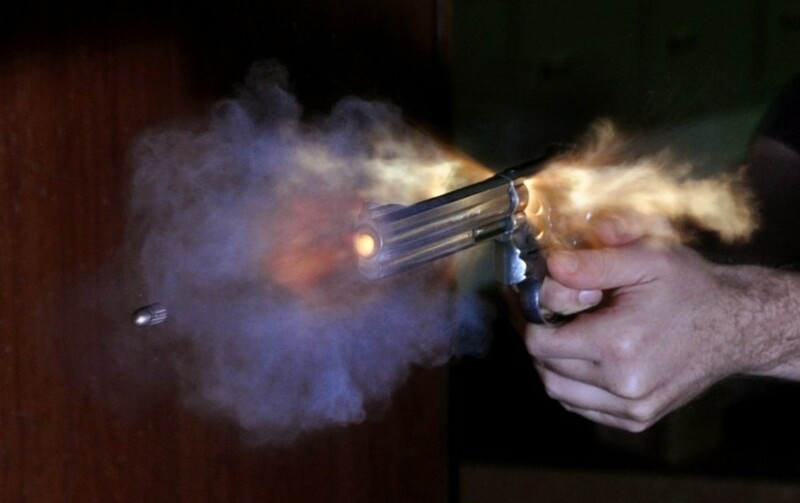 ….Routine handgun injuries leave entry and exit wounds and linear tracks through the victim’s body that are roughly the size of the bullet. 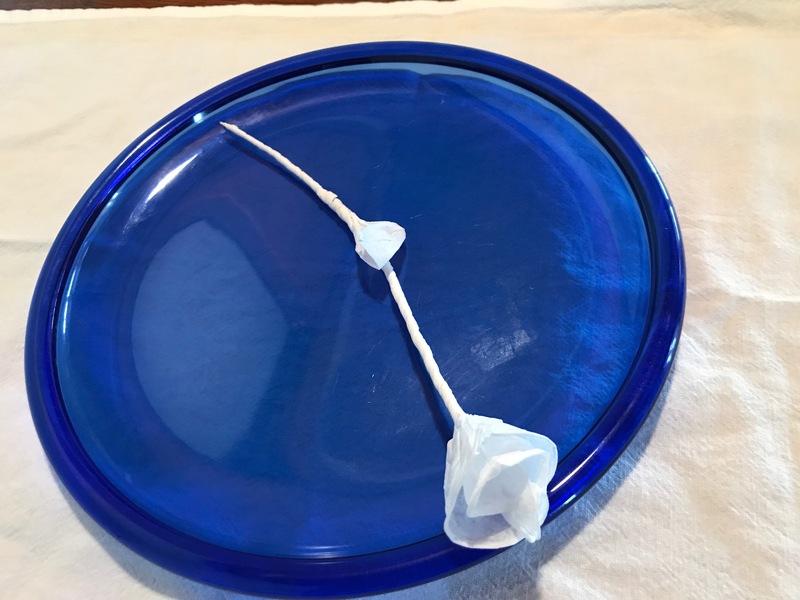 If the bullet does not directly hit something crucial like the heart or the aorta, and they do not bleed to death before being transported to our care at a trauma center, chances are, we can save the victim. The bullets fired by an AR-15 are different; they travel at higher velocity and are far more lethal. The damage they cause is a function of the energy they impart as they pass through the body. The N R A – originally founded in 1871 to promote marksmanship and safety, it was hijacked in 1975, becoming an intolerant vehicle for bullying politicians and citizens with a black vs. white vision of its one single cause: covering for gun manufacturers as they sell more guns. It’s become a fundamentalist Taliban-style crusade. The Second Amendment – you should really read it. It is only one sentence. Written in 1791 (no automatic weapons then) and (erroneously) interpreted by the Supreme Court in 2008. It clearly refers to “militia.” Today, that is the military. Some have pointed out that it also refers to “the State” rather than “the Nation,” implying its purpose was to control slaves in the South. Gun Density is a major risk factor for a high gun-related death rate. Easy Gun Acquisition is also a risk factor. Strict laws are associated with lower death rates. Being in school is not a risk factor (less than 1 % of all gun deaths). Therefore, turning schools into virtual prisons will not stop the vast majority of shooting deaths. Mental Illness afflicts non-shooting populations world-wide, independent of gun deaths. Mass shooting deaths (even high-profile ones involving White kids) constitute only 2 % of gun-related deaths in U.S.
Automatic / military style weapons ARE a MAJOR risk factor for mass shooting deaths. Ban all automatic, semi-automatic (military style) weapons and devices which allow a weapon to fire multiple rounds quickly. Any politician-proposed action short of the above should be rejected as B S. This includes minor tweaking of background checks, raising the age to purchase guns and automatic / military style weapons, token increases in Mental Health funding. These are distractions, meant to quiet the outrage, with no data to support their effectiveness. Treat any politician-proposed action which is not objected to by the NRA as B S.
If our current elected representatives won’t do it, elect politicians who will. Push voter registration of 17 year-olds. They’ll be electing new representatives soon. Lobby congress to direct the CDC to gather data and report annually on this epidemic. Repeal of the Dickey amendment needed. Treat the N R A for what it has become – a cover for the gun manufacturing industry (interesting read here about the man and the company that built the Parkland weapon) and an organized corruption machine which purchases our elected officials who sacrifice us for gun manufacturer profits. Pressure Amazon, Apple and other companies associated with the N R A to divorce themselves from this lethal parasite in the body of our patient – the people of the U.S.A.
After achieving the above, move on to address the 98% of gun deaths which are not high-profile mass shootings. Sometime in the future, bring the Second Amendment back to the Supremes for another interpretation. As a Public Health professional, a gun owner and a former member of the N R A, I’ve had enough. Even my gun-loving, hunter – buddy has admitted that there is no sporting use for automatic weapons. The kids of Parkland are trying to ignite a movement like ours in the 1960’s that pushed back against an immoral war, disenfranchisement of Blacks at the voting booth, and the treatment of women as second class citizens. We know this scene. They will be attacked for their activism, just as we were. We need to have their backs. To rescue our kids and grandkids from this epidemic. Thursday (July 7) some Democratic and Independent congresspeople tried to get the Dickey amendment language removed from the 2017 Health spending budget. This would have allowed the CDC to fund research on firearm injury and death, so that we could have solid facts on this Public Health epidemic. Dickey himself has reversed his position on his own eponymous amendment of 1996 and recommends that we allow the CDC to study this Public Health issue (see previous BLOG of June 19). But NRA-influenced congresspersons killed that effort. And, as more Americans are also killed, accurate data – also known as the truth – will be withheld from us all. The horrific killings in Baton Rouge, Falcon Heights and Dallas this week scream from the headlines, skewing – again – our picture of gun violence. These high-profile killings, which are a symptom of something badly diseased in the body of our society, are not the only killings from guns that we suffer. This pre-Dallas (Houston area) tragedy is a stark example reinforcing the findings of the now-classic 1993 Public Health study which showed that households with firearms actually experience MORE homicides than gun-free households (see previous BLOG and original article for details). That was the study that triggered the Dickey amendment. Aside from the death statistics related to guns (mortality rates), there’s the issue of non-fatal serious injury (morbidity). In the absence of CDC compiled data, we still have some idea of the scope of this issue. From 2010 through 2013, an average of 76,164 people went to hospitals annually for treatment of gunshot injuries. 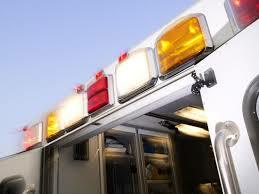 That’s 208 seriously injured people each day, more than eight every hour. That, folks, is an epidemic. 2. investors in gun manufacturing have responded by profiting from the value of firearm stocks. In the few hours between stock market close on Thursday and the opening bell on Friday, the Dallas shooting occurred. Friday morning, Smith and Wesson stock and Ruger stock both INCREASED by 3 to 5%. If that’s society’s immune system at work, we need a new immune system. Skewed impressions about gun violence – which are produced in this data void of the Dickey amendment – lead us to react with overheated emotion, anger, and finger-pointing. Almost always, in my experience, fingers point away from the true cause of the disease under these circumstances. 3. Treat the disease (P.H.’s main treatment is Prevention). But we’re not doing that. So, on the day that headlines scream “First Death from Zika in the U.S. !! 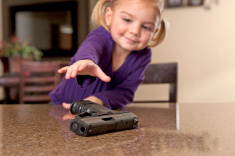 !” there were (an estimated) 208 serious injuries and 82 deaths from firearms. References: Agency for Healthcare Research and Quality, CDC, New England Journal of Medicine, Daily Kos, New York Daily News. “That Hijo de Puta Raul Castro,” blurted our dreadlocked taxi driver. “We need someone younger to lead this country.” His words of insult and passion spewed, incongruously, from a wide smile. 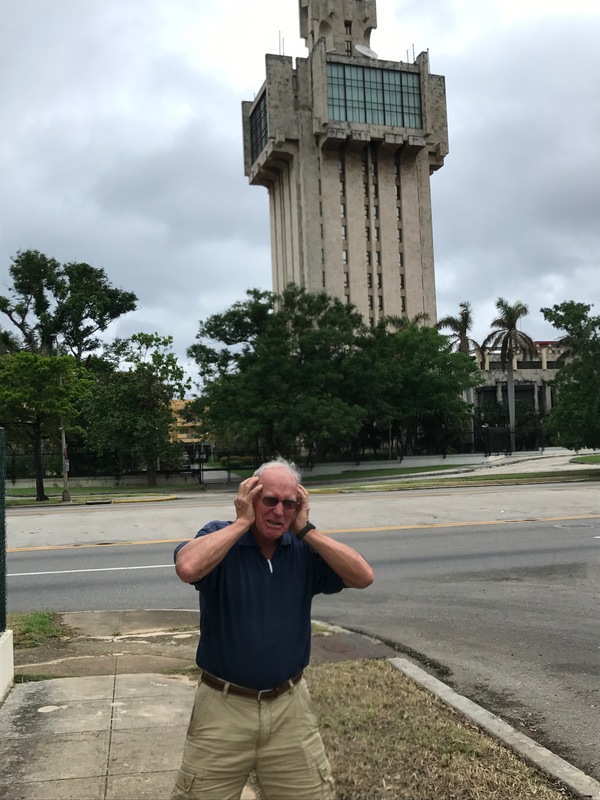 Taxi Man removed his hands from the wheel to adopt the position of the Cuban shrug: elbows pulled against his sides, palms outstretched, facing forward. “Como no. why not?” he laughed. 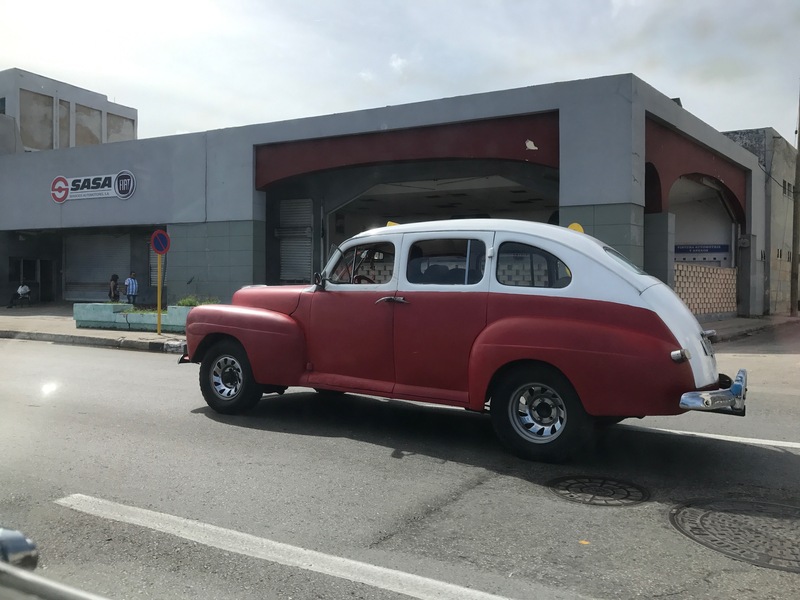 So, even before the Havana airport had receded in the taxi’s decades-old rear-view mirror, we were into politics. Everyone’s Friend prodded him on with his chortling Spanish. 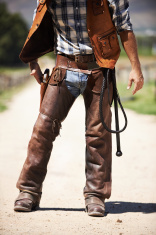 Horse-drawn wooden wagons and smoke-belching motorcycles passed us on the other side of the divided highway. How Capitalistic of you, I.O. thought in the back seat. A billboard filled with Che’s iconic face flowed by, flanked by tall palms and a stray horse who chewed the lush grass. But mental gymnastics attempting to link that face with Taxi entrepreneurship were interrupted by the word “Trump” from within E. F.’s effusive Spanish. He swerved his rattling taxi down city streets, avoiding small lakes that were disguising large potholes. He let us out in front of a decades-old colonial style house. Paint peeled from it, as it did from most of the neighboring buildings. Our two companions waited inside for us.